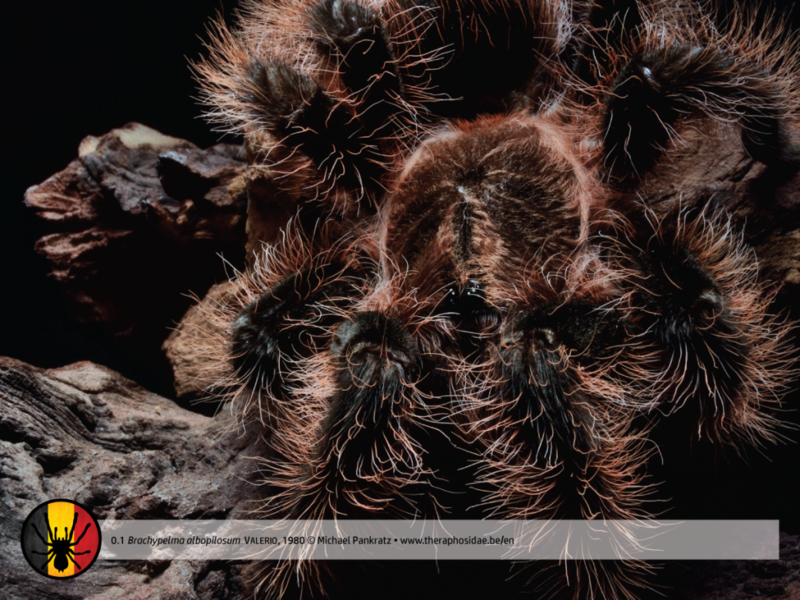 Brachypelma albopilosum Valerio, 1980, also known as “Curly hair”, is a beautiful and hairy bird spider from Costa Rica. She’s often being called “Honduran curly hair” as well, due to the fact a similar species with golden setae from Honduras was initially imported into the hobby. Whether or not this was the same species, remains to be seen. Except for a happy few owning a real one, it’s in our opinion very unlikely the Brachypelma albopilosum hobby form is the same species as the by Valerio described Costa Rican Brachypelma albopilosum. You will, however, notice more and more import nowadays is coming from Nicaragua. “Curly hair” is referring to the remarkably long and bright setae on her dark legs. Brachypelma albopilosum is very docile, often recommended as the perfect species for beginners, but however the genus “Brachypelma” might make you think different, she always lives very close to a direct water source in the Costa Rican tropical rain forests. Preferring it rather warm and humid, please don’t make the common mistake providing her dry substrate. Mature males are very similar to Brachypelma vagans’ males. Previous name: Brachypelmides albopilosa Valeria, 1980a, Euathlus albopilosa Schmidt, 1992a. Type: Terrestrial bird spider. Semi-burrower. Urticating setae: Yes, type I and III (abdomen). Origin: Initially Costa Rica (Upala – Alajuela, San Carlos). Considered to be thoroughbred Brachypelma albopilosum from Nicaragua as well. A similar sp. which most of the hobbyists own, comes from Honduras. It is being said Brachypelma albopilosum lives along the Atlantic side of the mentioned countries. Body length: ≤ 7/8cm. Brachypelma albopilosum is sexually dimorphic, with females being larger and heavier than males. Behavior: Brachypelma spp. in general are considered to be docile, but Brachypelma albopilosum is from a different level. I’ve never seen one giving a threat pose or flicking urticating setae. In captivity she’s out in the open plenty of times, showing off her cuddly appearance. Life expectancy: Females become up to 25 years old. Males are given a shorter lifetime of 4-5 years. Accessibility (1/beginner, 10/expert): 2. However she’s probably the most docile bird spider around, she needs a moist environment. Therefore she’s given a “2” in stead of “1”. Brachypelma albopilosum lives in tropical humid and warm area, in the tropical scrublands of Costa Rica, nearby a direct water source. Temperatures almost daily reach levels up to 30°C with high humidity. Please be informed of the fact the spider will protect itself against the burning sun underneath tree trunks, branches, leaves and abandoned burrows. Do not overheat the terrarium. Watch this video to have an idea of the local habitat. Temperature: 25-29°C (day), 20-22°C (night). Humidity: 65-75% (january-april), 75-85% (may-december). Adult: LxWxH: 40x30x30. Min. surface 3x span width. Smaller than adult: Min. 3x span width in surface. * Provide a few natural hides in the enclosure. Adult: Min. 1x body length. Smaller than adult: 1x body length. * Provide a humid environment, with a direct water source nearby. Wet season: May, june, july, august, september, october, november, december. Dry season: February, march, april. Coldest months: December, january, february. With an absolute minimum around 20,5°C and an avarage temperature around 25°C, “cold” is relative. Honduran curly hair”? Ironically, the name Honduran may in fact be right! (Longhorn and Gabrial, in prep.) Whether the species from Honduras is the same as the spider described from Costa Rica, remains to be seen, but similar specimens have been recorded from Nicaragua, which could indicate that these may be the same species distributed over a wide range from Northern Honduras down into Northern Costa Rica. These initial imports coming from Honduras were of a black spider with golden hairs on the legs and abdomen and thus more of an aura- (gold) pilosum than an albo- (white) pilosum. Hmm.. A spider is imported from Honduras and is given the name of a spider of Costa Rica. But look, they have long curly hairs on the legs so they MUST be the same thing! Could that have been the reason for the naming of the first imported specimens? Who knows? Could it also be that we are hinting that someone in the pet trade might have misidentified something? Shock! Horror! GASP! This spider fits the profile as described by Valerio, 1980. Caution: Breeding this species is not recommended! Because of the fact species from the Brachypelma-genus can be very similar, it’s hard to distinguish one from another. However people breed species with good intentions, different species have been mated plenty of times being convinced of the fact they were the same. Thoroughbred species from the Brachypelma-genus are available in the hobby, but make sure your source is valuable. If you’re very sure of what you’re breeding and/or you have more questions about the purity of your (Nicaraguan) Brachypelma albopilosum, please join this group. Breeding Brachypelma albopilosum is not that difficult. The area she lives in is overall hot and humid, what makes it a little bit more easy to breed. In general the female goes easy on te guy, except for when she is definitely not into him. When you notice very aggressive behavior towards him, seperate them immediately. Cannibalism may occur. Breeding reports. • No special post-mating care is needed. Keep temperatures and humidity farily constant. You might try to trigger the female increasing both temperature and humidity a little bit. • The female will start making the cocoon 1-3 months after mating. Deprive the cocoon, when desired, 4-5 weeks later. Store the eggs at a humidity of 80-90% and a temperature of 24-28°C. Expect 300-800 spiderlings to come out. • Brachypelma albopilosum, Brachypelma smithi or Grammostola rosea was probably the first bird spider of many hobbyists? • Thoroughbred Brachypelma albopilosum is very rare in the hobby? 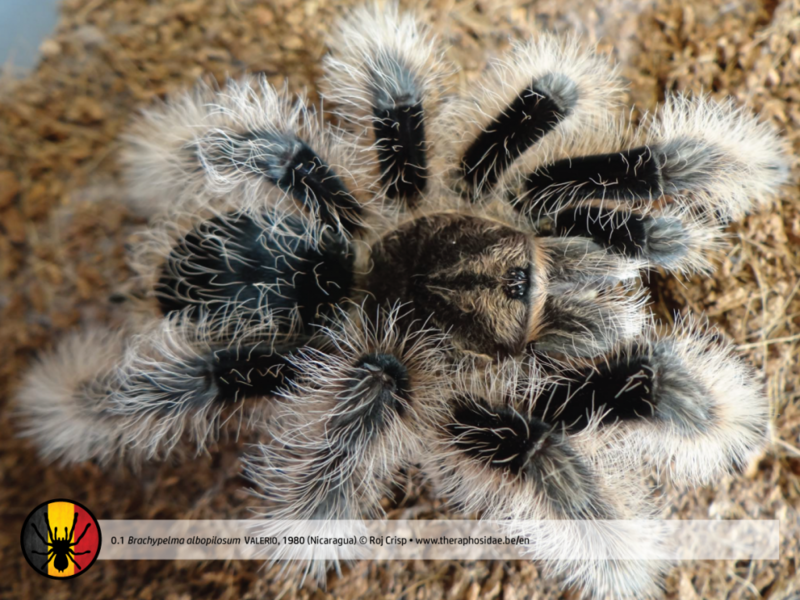 • The Brachypelma albopilosum, as described by Valerio has white setae, which is in contrast with almost every ” gold-haired Brachypelma albopilosum” in captivity? • Brachypelma albopilosum likes it rather hot and humid, which is in contrast with all other Brachypelma spp.? • Brachypelma was removed from the synonymy of Euathlus by Schmidt and was considered a senior synonym of Brachypelmides by Schmidt & Krause. Schmidt did not accept that synonymy, but failed to present evidence that the species he would place in Brachypelmides represent the sister group of the remaining species of Brachypelma (or of some other group entirely) (source).  • Very beautiful webpage about Brachypelma albopilosum, made by E. Hijmensen. Hello Lucrezia. Welcome on this website. I’m very happy you like it. To answer your question, I’d like to know what differences you’re actually looking for. Taxonomically there must be quite a few. Brachypelma sp. is larger. In my experience both are rather docile. Feel free to join our facebook group and/or send me an e-mail to dig deeper into the question. Kind regards. Dennis. hoop snel van u te horen . Hey Stephano. Ik heb geen shop, maar ik verwijs je graag door naar de facebook groep. U kan me ook een email sturen zodat we samen kunnen bekijken welke spin voor jou het meest interessant is. Mvg. Dennis.